Miller harnesses are designed with both comfort and protection in mind. 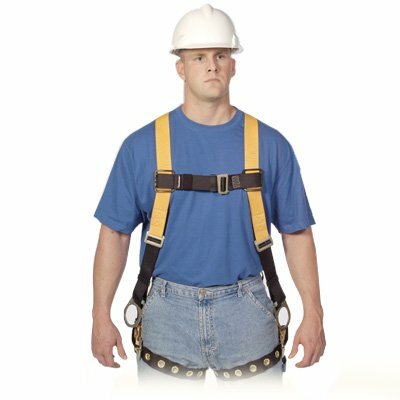 Full body harnesses like the Revolution Construction Series are constructed to be almost twice as strong as safety standards require so you and your workers can do your job with complete peace of mind, while also having features enhancing comfort. These and other design elements make Miller harness a great choice when it comes to fall protection. Like all other equipment, it is advisable to occasionally clean and properly store your Miller harness. Miller harnesses are made from nylon or polyester with metal components. Clean the nylon and polyester sections by first removing surface dirt with a damp sponge. After squeezing the sponge dry, dip the same sponge in bleach-free soap or detergent and work up a lather with a circular or back and forth motion then wipe off with a clean cloth. Dry off any of the metal components with a clean cloth. Hang out to dry away from excessive heat. Once dry, store your fall protection harness in a clean dry place that's free from fumes or corrosive substances.